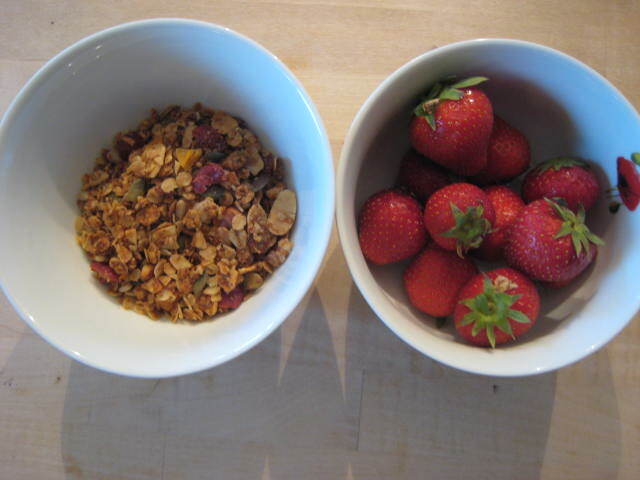 As I mentioned, it is expensive to make and works out the same price as buying Granola pre-made in a supermarket. But at €0.28 per portion and knowing that it’s your own home-made, chemical- and additive-free recipe, it’s a lot more satisfying! Pre-heat oven to 165C. Line 2 large baking trays with parchment paper. Combine the oats, wheat germ, oat bran, sunflower seeds,almonds, pecans and walnuts. Stir salt, maple syrup, honey, oil, cinnamon and vanilla in a saucepan. Bring to boil over medium heat. Then pour over dry ingredients and stir well. Bake at 150C until crisp and toasted (approx 20 mins) Stir once mid-way through to ensure it toasts evenly. Add shredded coconut 10 minutes before end. Remove from the oven. Allow to cool, then stir in the dried fruit. I love a generous bowl with strawberries, a spoonful of natural yoghurt and soy milk – delicious!